Someday I'm going to organize a race that starts at Southworth beach. Contestants must padddle over to Blake Island. 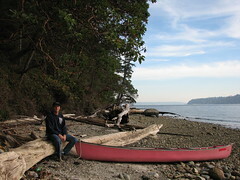 Once on the island, they must run the perimeter trail, and then paddle back to Southworth. This afternoon, Esther and I completed a gentler version. We canoed to Blake, hike around it, and canoed back. We did it in just under two and half hours. The canoe trip takes about a half hour each way depending on current and wind. The 4.5 mile perimeter trail took us an hour and a half. It was a great Sunday afternoon couple activity. Maybe we could make a couple's race! I'm glad you guys are coming up this weekend! I was asking Bjørn when we'd get to see you again? And Markus is gonna be here tonight. And lunch at the Pam's house on Sunday. We are making up for missed time with all the Bulthuises (sp? apostrophe instead?) in one week!